Last week i got four different packs of colgate toothpaste with some cartoon characters and animals pictures printed on the back side of it. 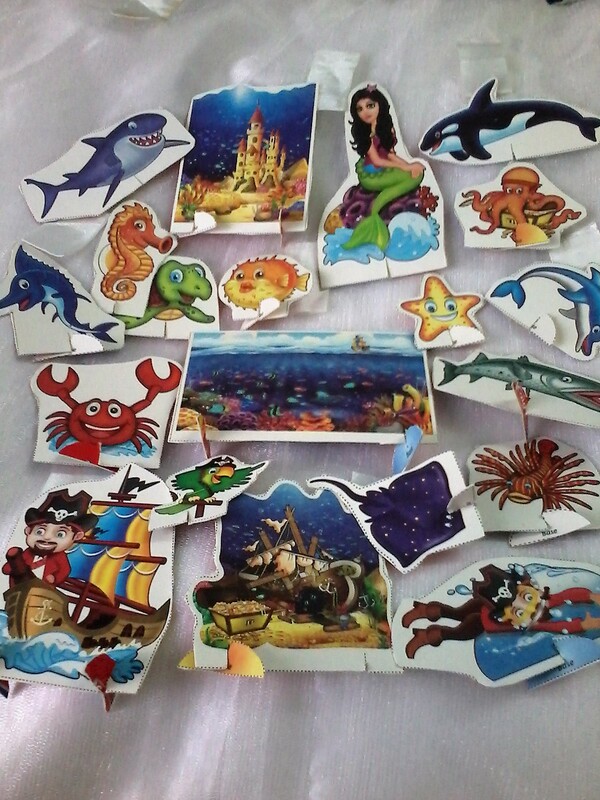 My daughter cut all those pictures and collected them to play with it. Kids now a days are very creative and imaginative. As soon as they got this , they started thinking about stories which they can make from these characters. Once upon a time deep down under the sea there was a beautiful castle . Some mermaids were living in that castle and were happy there . The queen mermaid was named Fiona . They had lots of friends like some star fish , dolphins , fishes , octopus and some other sea creatures. Once some pirates were going in a ship in that sea , They had some treasures which they have collected by looting some ships. The captain of the ship was Mr. Black Beard , he was also the head of the pirates . He had a parrot named Kiko. When the ship reached in the middle of the sea a big storm came and broke the ship , all the persons on ship were drowned except the captain , the ship sank down deep in the sea . Mr.Black Beard tried a lot to search his ship and his treasures but could not , so finally he gave up and sat on a log of wood from the broken ship and swam towards the shore . After some days again he tried but could not find the lost treasure. One day some mermaids were swimming and playing near the place where that ship was there . One of them saw the broken ship and informed her friends about it . All of them got curious and went near it to see whats inside .They were amazed to see such a huge collection of treasure, gold , silvers,diamonds and pearls. They took that treasure box to their castle and kept it there and decided that they would give those to some needy and good people . After few years a family was going for a long vacation in a ship on that same sea . The family had three kids, a boy named Faezaan , and two girls Sabhah and Hadia .They were going along with with their mom and dad . One day they were enjoying a cool breeze on the deck of ship when suddenly Sabhah saw a mermaid and shouted “Look a mermaid there ” , others tried to see but could not get a glimpse of that mermaid . In the night when all were sleeping Sabhah went on the deck again as she was curious to see that mermaid again , she wished and prayed that she could play with that mermaid , and her prayers were answered , she saw that mermaid near her ship , she called her and asked her to come and play with her. The mermaid was initially afraid but later on came and played with her for some time . Then she went back and Sabhah also came back to her room and slept . In the morning she told about this to her siblings, but no one believed her . In the same ship Mr Black Beard was there who had came to search his lost treasure . He went inside the sea to search the lost treasure , and after a long search he found it in the mermaids castle , he had made hostage to all the mermaids only Fiona managed to escape and she wanted some one to help them , she came to the ship and asked Sabhah and her siblings to help her . Sabhah told about this to her father and they all decided to do something ,the security personals of the ship went with Fiona and caught Mr Black Beard and made all mermaids free and Mr Black Beard was taken in to custody to be handed to the Police . All the mermaids were too happy and thanked every one . Next morning when every one had their breakfast and they were enjoying cool breeze on the deck of ship they were amazed to see group of mermaids with lost of gifts . They all praised kids and thanked every one for their timely help and gave those gifts to all . Kids were too happy and excited to get so many gifts and had a great time with mermaids , making a promise that they will try to visit them again and again so that they can have lots of fun . This sea voyage was one of the most memorable journey kids have ever taken where they could make friends with mermaids and do lots of adventures . Such a long and lovely story by kids , there are few more and i really enjoyed them all . After listening such stories i could recollect my childhood days when we used to dream about mermaids and such voyage on ship . I would like to thank Colgate for coming up with such great and innovative ideas and stuffs where kids can play , enjoy and learn new things . My youngest one Hadia learned about some new sea animals and learned some new English words and she also tried to tell me a story from these pictures in her way of telling story , some English and some Hindi words . Its better that kids do some creative thinking with such stuffs rather than getting glued to television or smartphones which in the long run is not good for them. 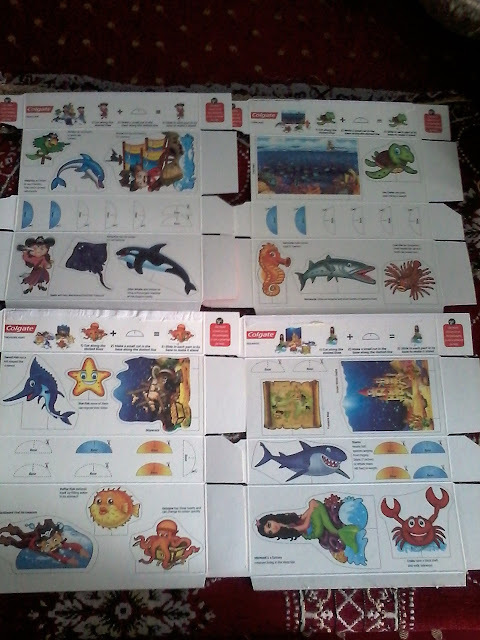 This Colgate Magical story concept is excellent which has not only helped kids to come up with some great stories but also helped their parents to spend some quality time with their kids and enjoy a series of story telling from innocent kids .